Within 10 months of enacting toy standard to control children’s exposure to harmful chemicals and heavy metals in toys, the government has drafted yet another standard. The government has said that the Mandatory Toys Standard (MTS), which was enforced on July 15, 2017, had errors in terms of defining the value and testing method of harmful chemicals and it had overlooked a crucial procedure. “Such standard affect the import and exports. Prior to introducing such standard, we have to inform the World Trade Organisation as it should be in compliance with the provisions mentioned in the Agreement on Technical Barriers to Trade (TBT), which were overlooked,” said Bipin Rajbhandari, senior divisional engineer at the Ministry of Forest and Environment (MoFE). Like the MTS, the new standard has also fixed the maximum permissible limit for concentration of heavy metals and elements in toys. However, the standard looks comparatively weaker in comparison to its predecessor, as it has excluded four chemicals and elements that are hazardous to humans. The MTS had restricted the maximum value of a total of 12 elements and chemicals and fixed the maximum amount of eight harmful heavy metals and elements. The new standard has excluded four chemicals - Bromine (Br), Bis Phenol A (BPA), Phthlates and Zinc (Zn)-- that were listed on the MTS. According to Anjana Suwal, programme officer with Center for Public Health and Environmental Development (CEPHED), exclusion of harmful chemicals shows a drawback in the proposed standard that is likely to put public health in danger. “It is sad that the government has excluded four dangerous chemicals from the new standard,” said Suwal. However, the government has said that the excluded chemicals are irrelevant for setting standard for toys. “These chemicals are not important. After going through international standard, we found them to be irrelevant. Earlier, we had included chemicals which were not in other international standard as well,” said Rajbhandari. A CEPHED study in 2013, conducted on 100 toy samples, collected from different parts of Kathmandu Valley, had shown that 54 percent of the items contained far higher levels of toxic heavy metals such as lead, mercury, cadmium, chromium and bromine than permissible limits as per international standard. Continued exposure to toys containing these toxic chemicals affects physical, mental and intellectual growth of children, according to health experts. Besides removing four toxic heavy metals, the new standard has also changed the total concentration in toys to migratory concentration of these hazardous elements from toys to children, another downside of the standard, say experts. The total concentration denotes the total amount of such chemicals in toys, whereas the migratory amount refers to the amount that is transmitted to users once they are exposed. “The maximum limit of these chemicals should have been the migration amount from toys, not the total amount present in the toys. We had said their total concentration should not cross the maximum limit as mentioned in previous standard, which is not possible. They are likely to have higher concentration,” said Rajbhandari. 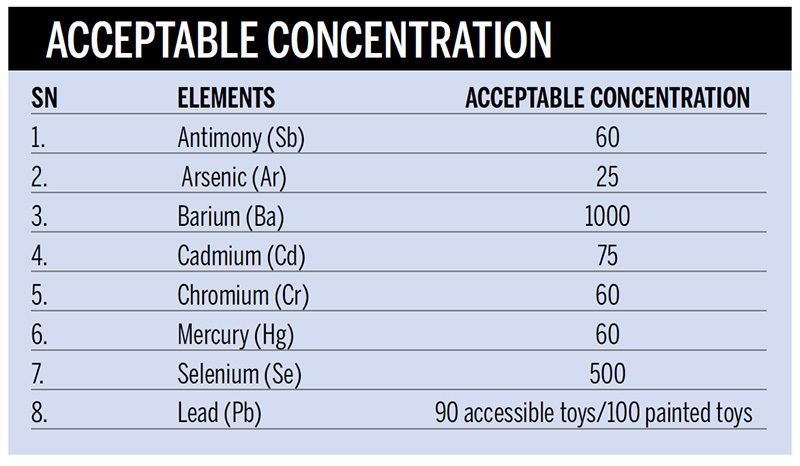 The proposed standard has, however, fixed the total concentration of lead (Pb) in these toys. According to the new standard, the total concentration of lead in toys and in paints, painted or coated surfaces of toys materials shall not exceed the maximum concentration limit of 100 ppm and 90 ppm respectively. “If the maximum total concentration of lead was included, why was similar standard not fixed for other toxic chemicals that are equally hazardous?” said Suwal, adding that the standard has once again missed out the mandatory labelling provision, mentioning the exact amount of chemicals, their amount and warning. For now, the government has put the previous standard on hold and sent the new draft to the TBT for their suggestion.